Travel awards are presented to new investigators with an area of study in imaging informatics and who either are currently in a full-time training program or have completed their training program within 2 years of the SIIM Annual Meeting. 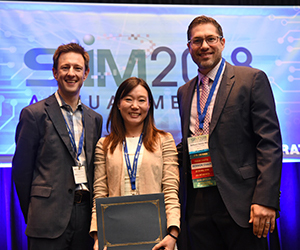 Our team member Sehyo Yune, MD, MPH, MBA was awarded SIIM 2018 New Investigator Travel Award! Yune, S., Lee, H., Kim, M., Tajmir, S., Gee, M., Lev, M., Do, S., 2018. What Machines Can Read: Gender Identification from Hand and Wrist Radiographs in Children. In Proceedings of the Society for Imaging Informatics in Medicine Annual Meeting.